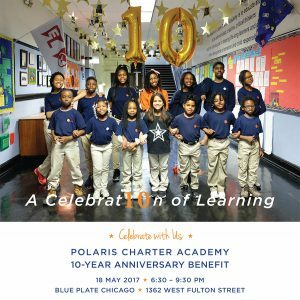 May 18, 6:30-9:30p at Blue Plate Chicago (1362 W.Fulton Street, at the corner of Ogden Avenue)—Join us for our 10-year anniversary celebration and annual benefit. As we gather to celebrate a decade of discovery and learning, guests will enjoy a fabulous evening of cocktails, hors d’oeuvres, raffle items, giving back and making a difference. Some of our raffle prizes include tickets to Cubs and Sox events, sports memorabilia, dining experiences, theatre packages, music programs, museum visits and private tours of art collections, and much more! All proceeds will support Polaris Charter Academy Learning Expeditions, programs, and education initiatives. Become A Sponsor. Your investment in Polaris helps create a positive future for our students and gives them the opportunity to excel and achieve success in the classroom and to create a better world for themselves and their community. Donate an Item. If you would like to contribute an item (gift certificates for restaurants, spa packages, sports or theatre tickets, etc.) to our fundraising raffle, please fill out this form. EVENT ENTRANCE: The event entrance is on the Ogden Avenue side of the building (333 N. Ogden). Please take the elevator to the 2nd floor to enjoy our event. TICKETS: We’ll have your reservation name(s) on an attendee list at the entrance. There’s no need for paper tickets. PARKING is easy and inexpensive. There is street parking around the building. There is also a self-park lot ($8 after 4pm) directly across from our event, with entrance on Fulton Street. See you on May 18 to celebrate Polaris Charter Academy!